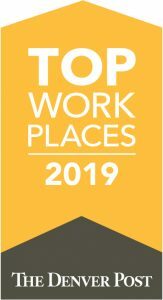 GREENWOOD VILLAGE, COLO., April 15, 2019 – CCIG, one of Colorado’s fastest-growing independent commercial and personal insurance brokerages, has once more won recognition as a 2019 Top Workplace by The Denver Post. CCIG is planning for even more growth and recently acquired a new headquarters in the Denver Tech Center with space to accommodate an expected workforce of more than 150 people. The Top Workplaces award is based solely on employee feedback gathered through a third-party survey. The survey measures workplace culture, including employee alignment, execution and connection. CCIG has won the Top Workplace award three times before. CCIG emphasizes career development and mentorship of new employees. The brokerage provides its employees with a robust benefits package, licensing coursework tuition reimbursement, annual incentives for top performers, and contributes to the cost of health club memberships and wellness initiatives. CCIG also has established an Emerging Leadership Development Program, a two-year program to better equip its future leaders with the skills necessary to protect its culture and reputation as it grows. Founded in Greenwood Village, Colo., in 1985, CCIG employs more than 95 commercial and personal lines insurance professionals. It has won repeated recognition as one of the nation’s leading independent insurance brokers, offering commercial property and casualty insurance, as well as risk engineering services and health benefit plans for employers.